As you scroll down a pathway page, you will see that each pathway is made up of a number of linked steps designed to help you progress in your learning about the topic, with several options for learning activities at each step. Some options will be more suited to adults working alone, some to children or young people, and some for all ages together. It is up to you whether you follow the steps or use the materials as you feel led, and you can always choose to do more than one learning activity from a particular step. When you click on an option from the list it will expand and show you all the resources that are part of that option or needed for that session. Click again on the option title to close it. text based resources: click 'view' to preview these in the 'BFT viewer' (which will open in a new tab) or 'download' them as pdfs. If you are using a screen reader you will need to download any pdf file and then open it to read it. video resources: clicking 'view' will either take you to an embedded video player within Being Friends Together (which you can enlarge to full screen) or to the relevant page on another website where you will need to click on the video title, depending what kind of website is hosting the video. audio resources: click 'download' to download the mp3 file to your computer. Each pathway, option and individual resource in Being Friends Together has its own unique catalogue number, displayed in the top right corner of the screen (and included in option titles). A quick way to find something that you have used before or following a recommendation from a friend is to search for it using its catalogue number: click on 'Catalogue Number Search' at the very top of the screen on any page of Being Friends Together, then type the catalogue number for the pathway, option or individual resource that you are looking for into the search box. 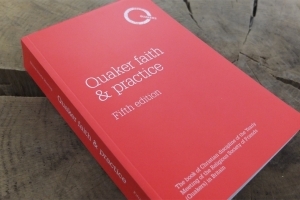 Reading Quaker faith & practice invites us to explore Quaker faith & practice through a programme of reading and reflection sessions. We hope to discover together how our book of discipline can speak to our condition and deepen our spiritual lives. A reading calendar has been produced as a suggestion, a prompt, and an encouragement for individuals and groups to discover the richness to be found within Quaker faith & practice. There are two versions: a 19-month and a 16-week one. Both cover the whole book and can be started at any time. You can find more information about this reading programme here. Suggestions for new content are welcome. Online https://forms.quaker.org.uk/qfp-idea/ or email qfp@quaker.org.uk or write to Revision Committee, Friends House, Euston Road, London NW1 2BJ. Chapter 21 explores aspects of our personal journeys as Friends, including: our youthful experiences, coming to know and accept ourselves, living a full life, creativity, getting older, and our approaches to death, suffering and healing. Chapter 23 explores Quaker approaches to social responsibility. This includes reflecting on our understanding of Quaker testimony and how we put our faith into action, with reference to particular aspects of social justice, individual and community life, and Friends’ relationship to state authority. Chapter 3 offers general guidance about meetings for church affairs, including: the sense of the meeting, participation in meetings for worship for business, clerkship, nominations and appointments, the use of small groups in identifying needs and reaching decisions, and authority for public statements. Chapter 2 explores our experience and understanding of worship and prayer, including: silent waiting, vocal ministry, children in our meetings, enriching our worship, meetings for church affairs and our personal discipline of faithfulness. Chapter 5 looks at the origins and purposes of regional Quaker groupings and general meetings, and Chapter 6 covers the history, purposes, functions and constitution of Britain Yearly Meeting.